Part two of Rockstar Games’ Design and Technology series dives into Max’s targeting, weapons, and tactical movement, explaining how each of these systems works to create a totally seamless and believable cinematic experience. 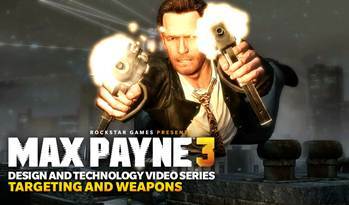 Through advancements in physics technology and animation, developer Rockstar Studios is able to capture the precision targeting of a first-person shooter and retain the strong characterization and story elements intrinsic to a third-person perspective. This same technology provides a greater sense of realism to all of Max’s actions and reactions, allowing the character to adjust naturally to the on-screen position of the reticule, even while in a prone state. Thanks to these gameplay innovations, players will enjoy total control over Max’s movements and actions - paired with fluid and precise targeting - at all times. *Sorry guys and gals, can't get the video to embed- so just click here.